Static Medium: The original painting of “Fall” is quite massive at 72” x 33”, though I know it’s common for you to work at twice this size or larger. How long does a piece of this scale take, and how many pieces might you be working on at any given time? Martin: The length of time it takes me to make a painting isn’t dependent so much on its size as the amount of stuff that’s happening in it. When I’m working on a series I tend to rotate through a number of paintings at the same time, so gauging the length of time I spend on each tends to get muddled and lost in the process, but I’d say as a general rule I never spend less than two weeks on a piece, and rarely more than two months. Static Medium: The color palette in this piece is gorgeous. When you’re working on a painting what’s your process like, if any, as far as accumulating references for both the subject and the environment? Martin: I source out quite a bit of reference for each painting I plan out. In this particular instance my main inspiration was a painting from 1881 by Lowell Birge Harrison called “November". His initials are carved into a tree in the piece, as an homage. Following that I gathered photos from the landscape, leaves, and trees in the Hudson Valley in upstate New York - where I live and work most of the time. 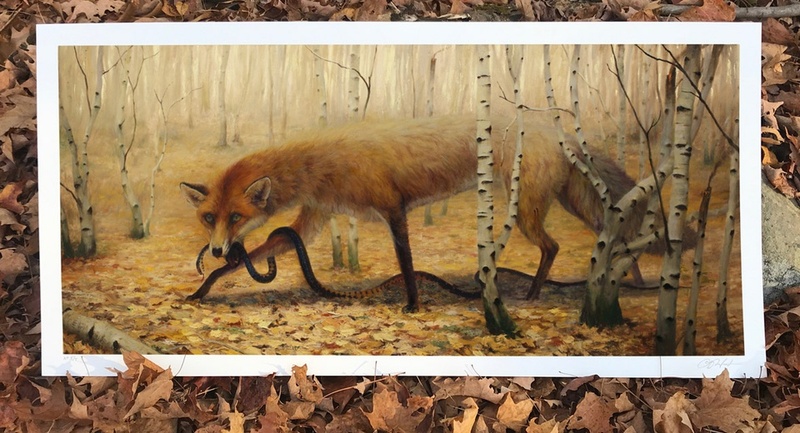 The reference for the fox and snake was largely composed of various images I found online. Static Medium: Can you share a little bit on how this particular piece came to be, and what it means to you? Martin: The painting belongs to a series called The Archaic Revival. The title is a reference to a theme developed by psychedelic philosopher Terence McKenna, who posited the idea that there is a resistance to the status quo cultural framework and ideologies underway in the form of a renaissance of sorts: that of revisiting and applying ideas, practices, and symbolism of our ancient past to counteract the sense of dis-ease many feel residing inside the structures of the industrialized, commercialized, militarized age. In exploring this idea I read a lot of Alan Watts, Joseph Campbell, Carl Jung, and other thinkers who have pointed to the ever-present manifestation of archetypes, and what stories and myths from the past that address these archetypes might have to tell us about our contemporary situation. In “Fall” I was interested in taking a look at the concept of the price paid for a pursuit of knowledge, the seeking of wisdom. I wanted there to be a bit of a play on words, harkening to the original “fall” as envisioned in the Adam and Eve story of the western mythos: the loss of “innocence” and “purity" in exchange of waking up, and in this endeavor to risk judgment, persecution, inquisition. The snake from that old myth could in essence be regarded as the first liberator of the human consciousness: the initiator of a dialogue with the self-aware inside of us. Maybe the fox in my painting is the powers-that-be, seeking to suppress this impulse. To the systems that want to uphold a bottom line, the freedom to ask questions - to seek alternate truths - is a threat. Static Medium: Lastly, I’ve got to ask. Is the snake venomous? Is the fox going to be ok? Martin: No one here gets out alive.